Even if you are not brewing, this is a great event to attend! What better way to share homebrewing with someone new! Bring your Friends! Bring your Enemies! Bring your Relatives! Bring your Neighbors! Heck, Bring your Dog! What is Big Brew Day you ask? 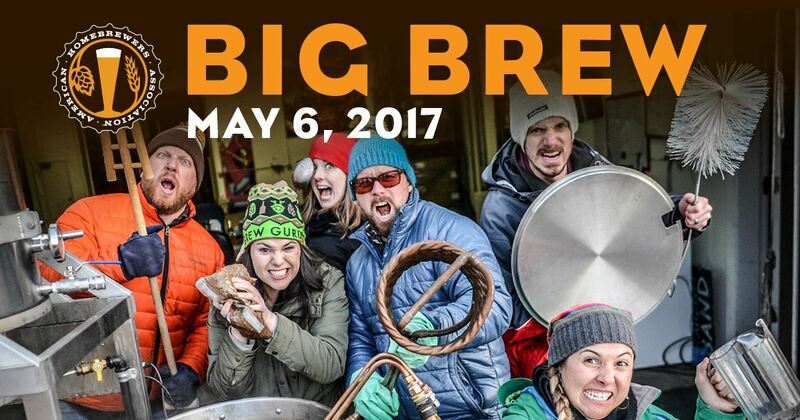 Big Brew Day is an AHA sponsored event where homebrewers share their passion about the craft with others. Brewers bring their equipment to the event, and brew a batch (or two) of beer during the day. They share ideas, stories, beer and have a great time! Oregon Brew Crew is teaming up with F.H. Steinbart, Imperial Yeast and Cross Roads Canning for this years Big Brew Day. We are planning lots of great stuff this year! Whether you plan to brew during the day, or just want to learn from those who are, please come out and join us. Bring your non-brewing friends too! F.H.S. will pay for 1/2 the cost of your ingredients. In addition, you can call or email in your order a few days before and they will prep it, including milling your grains. Just don't wait until the last minute! You can pick up your ingredients the day before or the morning of. Please don't call in your order on Friday night. Imperial Yeast will have hot water available, so you'll be able to mash in as soon as you set up. Cold water will also be available for chilling as well. Hoses will be at a premium, so bring your own to ensure yourself of water supply! Beer!!!! Well, we couldn't have a Big Brew day without beer! FHS is bringing beer, Imperial Yeast will have some, and of course, you are welcome to bring some as well, because we all like to share our beer, right??? Food!!!! Our Burgermeister Meagan Thompson will be onsite grilling up some homemade homebrew sausages, with potato salad and other tasty snacks. FUN! Yes, I guarantee you'll have a great time! ATTN BREWERS: If you are planning to brew during this event, we need you to do the following. 2. If you would like to have your ingredients prepped in advance, contact Adam @ F.H.S. 503-203-8793 or adam@fhsteinbart.com. They will prep your order (and even mill your grains as long as you order in advance) How awesome are the employees there?? ?